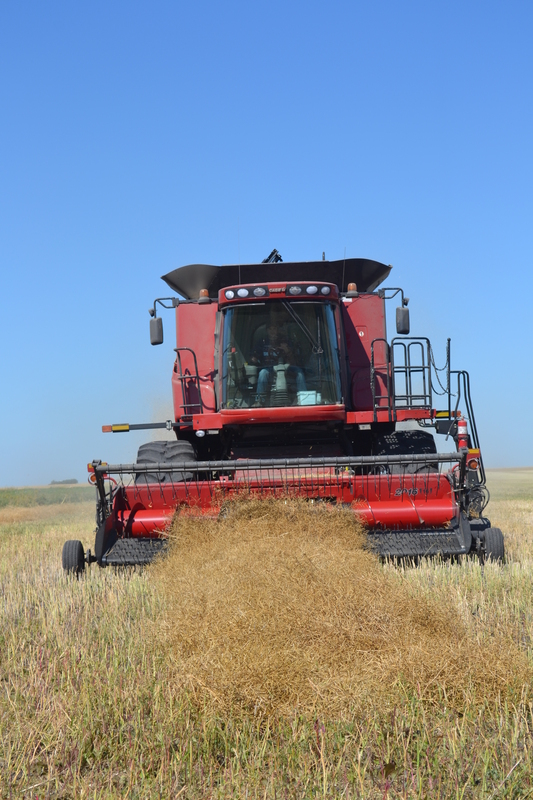 Canola is often referred to as western Canada’s Cinderella crop because of its humble beginnings and fast climb to multi-billion dollar status. The oilseed is my favorite crop because of its bright yellow flowers. The countryside around my family farm is a sea of yellow during the summer. 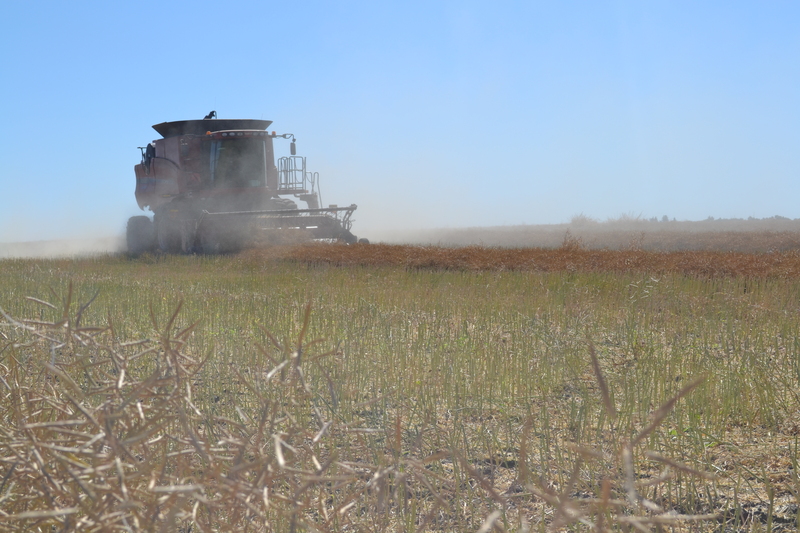 Here are some photos from our recent canola harvest. We use a swather to cut the canola crop into rows. 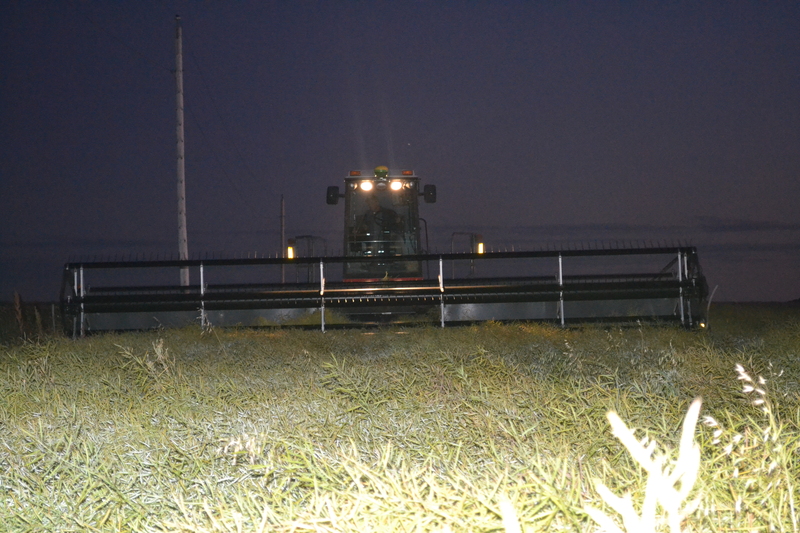 Canola swathing is often done when humidity is high, after a rain or at night. The canola then sits in rows for a while to further ripen. Finally it is harvested with our combines. Stirring up dust. Canola plants in the foreground. 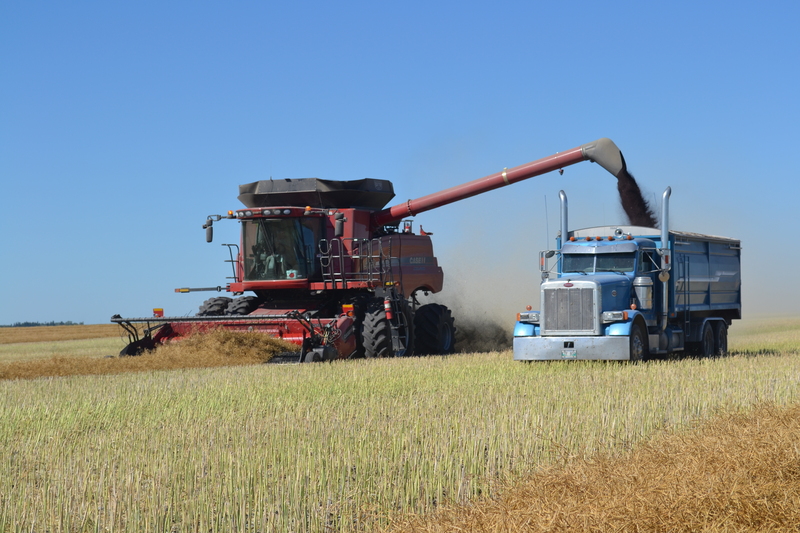 When the hopper of the combine is full of canola, it is unloaded into the grain cart or grain truck. 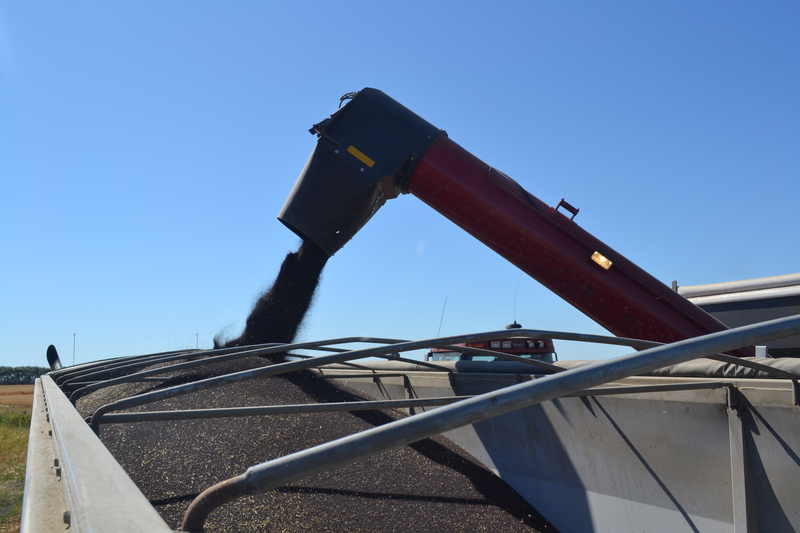 The canola is then taken to the yard where it’s dumped into a grain bin. Dumping canola from the grain cart into the grain truck. When combining canola it’s important to check for green seeds. 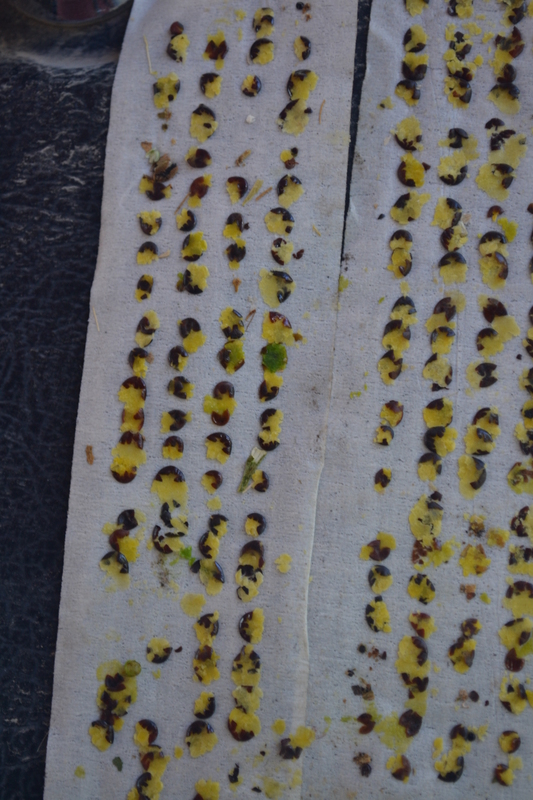 Canola should not be harvested if there are more than two or three green seeds in the sample. Here’s how you do that. 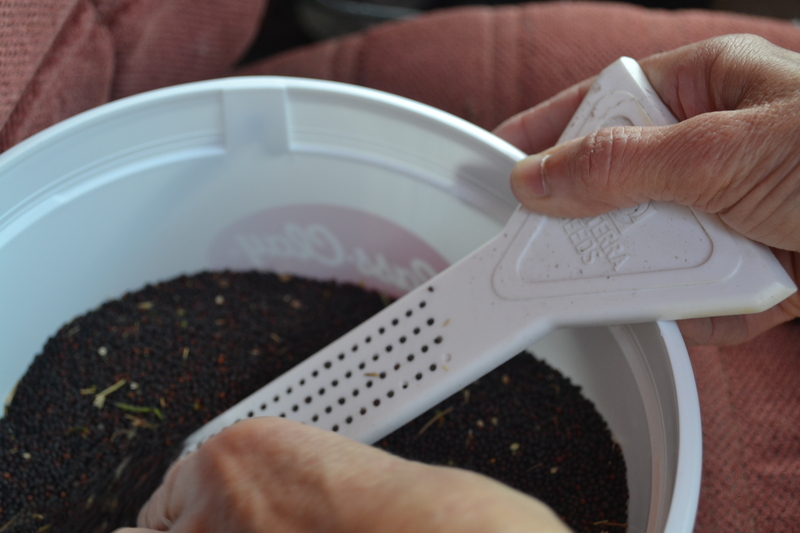 Stick this little gadget into a pail of canola seeds to fill the 100 holes with seeds. 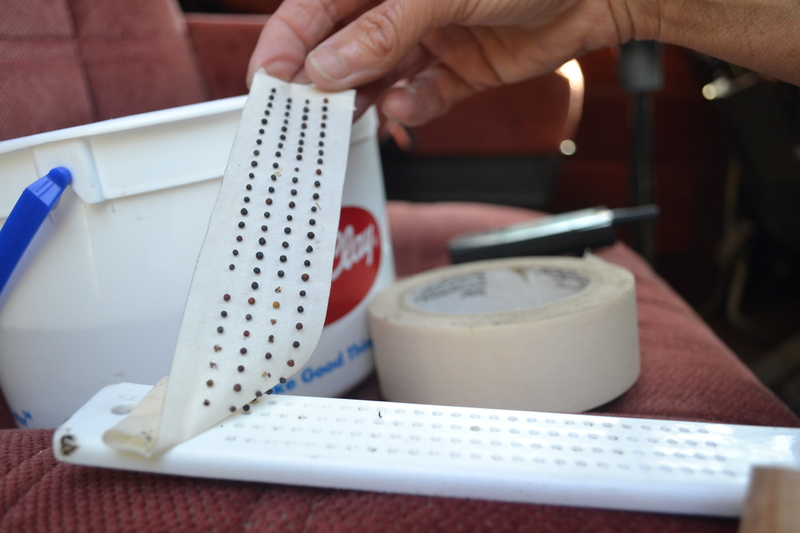 Lay a piece of masking tape over the canola seeds, press down and then remove the tape with the seeds on it. 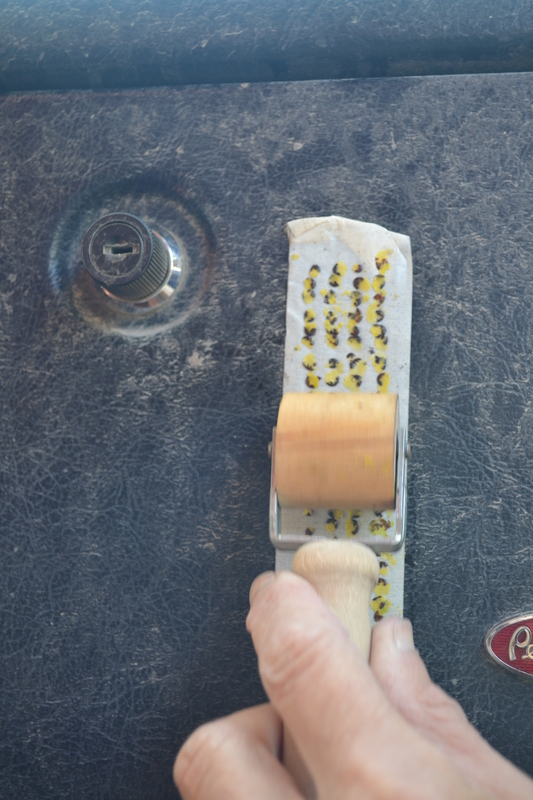 Use this little roller to crush the canola seeds on a hard surface. Ensure that all the seeds are yellow and not green. You can see one green seed on the left tape. It’s also important to take samples of your grain and test it. Here’s how you do that. 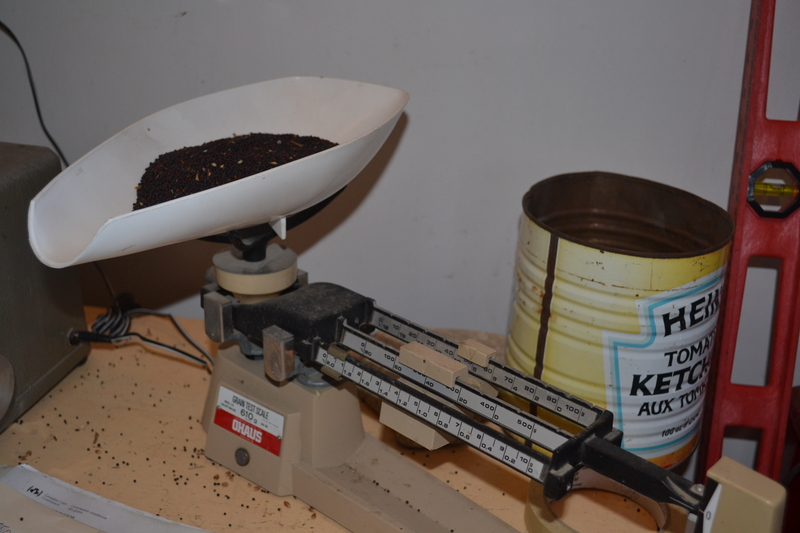 Measure out the sample, for example, 250 grams of canola. 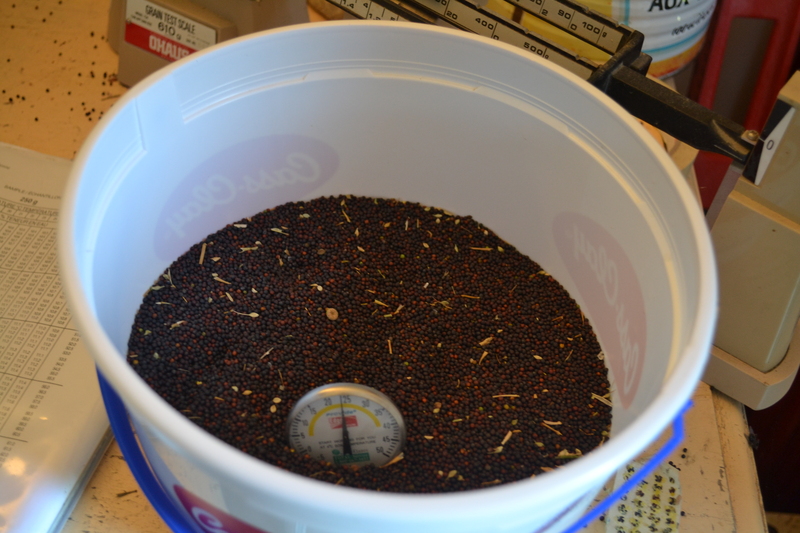 Stick the thermometer into the pail of canola seed to get the temperature. Dump the pre-weighted sample into this machine, calibrate it and take the reading. Using the numbered reading from the machine and the temperature of the grain, check the nearby chart and you’ll find out what the grain is testing. 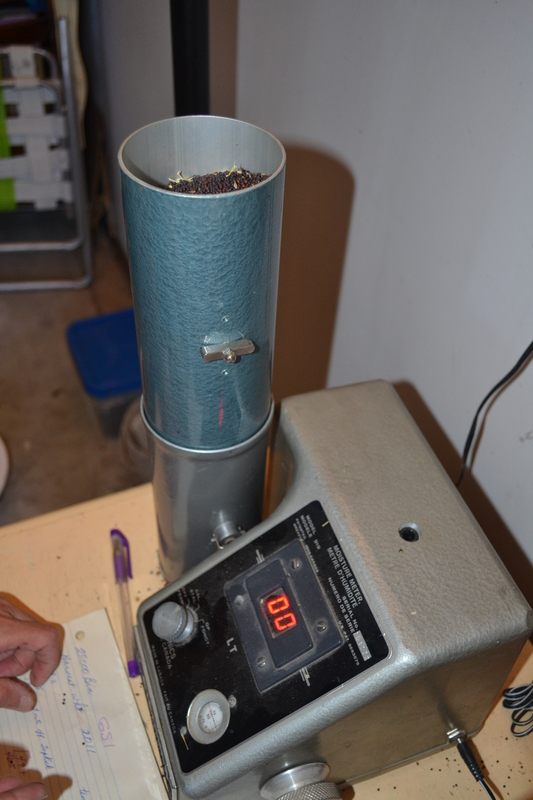 The purpose of this is to determine whether the grain is wet or dry. 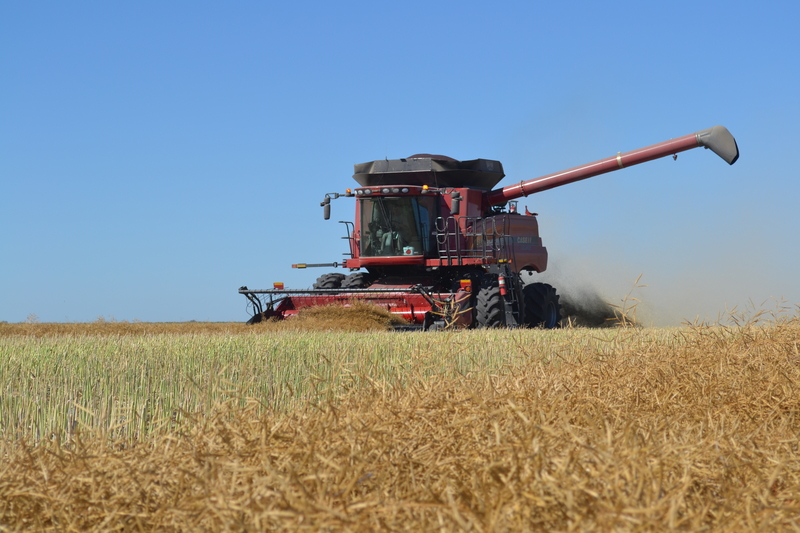 If possible, combining should only be done when the grain is dry. Canola is used to make a variety of products including canola oil. So the next time you reach for a bottle of heart healthy canola oil, remember the hard-working farmers who grew that canola. For more information on Canada’s canola industry visit the Canola Council of Canada website: http://www.canolacouncil.org/ind_overview.aspx And I welcome your questions and comments. makes me feel right at home. thanks teresa! very interesting. Thanks for explaining the testing. We grew canola one year a while ago. What I remember was the stubble was sharp as knives. But there is no market around here for it.